As most of you know, these are designs that have already been digitized, and they can be bought as a set, or I can split up the whole dress if you only want certain parts. I send the file type you need. The designs are sent in one general size for you to re-size and revise. If you cannot do it yourself, I can provide that service. I am also posting this because I would like to gather pics of work that any of you have done using my designs over the years for a new gallery. I am thinking I would like to organize the pics by dressmaker since some of you have used so many of the designs, so this can be a way for you to showcase a gallery for yourself. If you want to send pics, please include how you would like to be named and the date of the dress. Thank you all! Happy sewing! Here is a pic of Andrea Whitrow’s son in a vest she made using my dragon design. Such a cutie! This front vest design will be split into 4 sections. Below is a pic of the design on the pattern, and another pic of the 4 splits with the necessary basting boxes and placement lines for re-hooping so you see how this has been broken up. Part #1: You will start with “pt 1 left front.” Below is the pic of the file and the placement lines in the file. The center placement lines (the longer line with the crossbar on top) will stitch out onto the stabilizer first to help you line up your fabric. Then, place the fabric onto the stabilizer (sticky back or use temporary adhesive spray) lining up your drawn line with this stitched line. The basting box will now stitch, followed by the design and then the placement stitches for the next part. Part #1 is complete. Remove from the hoop and remove excess stabilizer. Remove the first basting box but be careful not to remove or pull on the first set of placement lines. Re-hoop the sticky back and the tear away for the next part. Part #2: You will continue with “pt 2 right front.” Below is the pic of the file and the placement lines in the file. 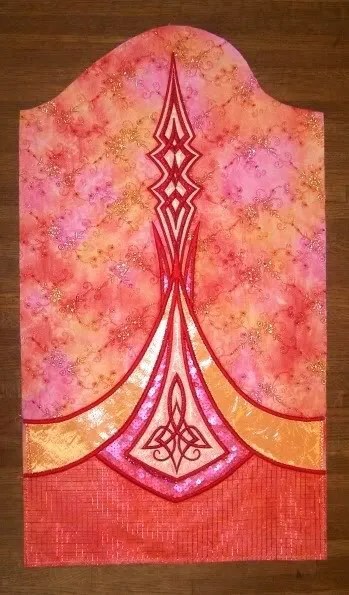 The center placement lines (the longer line with the crossbar on top and the placement crosses) will stitch out onto the stabilizer first to help you line up your fabric. Line up the placement lines from Part #1 on the fabric piece with the new lines. Use the points where the lines cross as your center points for each placement. You want to be as precise as possible because this section includes split lines that cross the design parts stitched first. Finish stitching part 2: the basting box will stitch, followed by the rest of the file. Part #2 is complete. Remove from the hoop and remove excess stabilizer. Remove the first basting box but be careful not to remove or pull on the first set of placement lines. Re-hoop the sticky back and the tear away for the next part. Part #3: You will continue with “pt 3 center front.” Below is the pic of the file and the placement lines in the file. Line up the placement lines on the fabric piece with the new lines. Use the points where the lines cross as your center points for each placement. Finish stitching part 3: the basting box will stitch, followed by the rest of the file. Part #3 is complete. 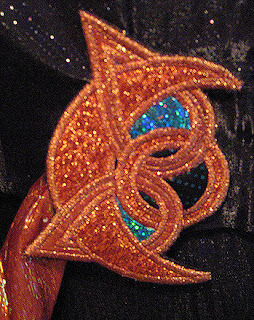 Remove from the hoop and remove excess stabilizer and all placement stitches. Part #1 is complete. Remove from the hoop and remove excess stabilizer. Remove the first basting box but be careful not to remove or pull on the first set of placement lines. Re-hoop the sticky back and the tear away for the next part. Part #4: You will continue with “pt 4 center front.” Below is the pic of the file and the placement lines in the file. Line up the placement lines on the fabric piece with the new lines. Use the points where the lines cross as your center points for each placement. Finish stitching part 4: the basting box will stitch, followed by the rest of the file. Part #4 is complete. 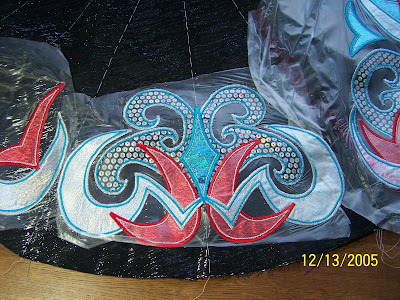 Remove from the hoop and remove excess stabilizer and all placement stitches. Yes, several years of reorganizing my life has made me silent. But, I am finally moving forward. There is a new online store in the works. I am figuring this out myself, so it is moving slowly, but it feels good to take control again. If you want to check it out, it is here: Taoknitter Arts. There is much to be done to update this blog, and as soon as the store is truly up and running, I will get to it. Thank you for your patience and for hanging with me. Slowly but surely, yes, new things are happening. I decided last year that I needed to make Taoknitter Arts designs available for automatic purchase and download…and the site is up! Little did I realize what an extreme undertaking this was going to be! The sheer time involved in just getting designs ready, converted and then uploaded has been staggering. So, the site does not have the full catalog of designs up yet, but we will get there. Photos of all the designs can still be seen on Flickr. If you want to see all of the design parts with dimensions and prices, just write to me at taoknitter@gmail.com and I will make it happen. 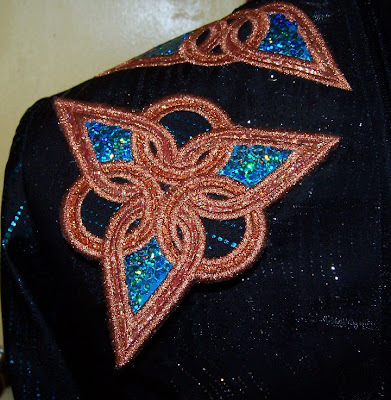 And I have recently updated my Customer Creations gallery with all of the fantastic work done by dressmakers using Taoknitter Arts designs. I am so impressed! 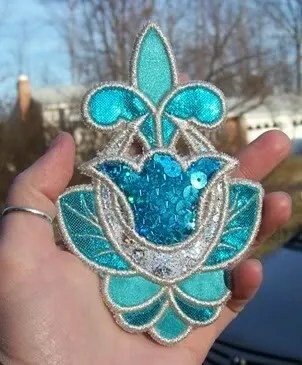 Please visit Customer Creations to see all of the creativity! If you have a dress and a happy dancer to add to the gallery, please just let me know. I hope I can keep it all straight!